Silver/Grey hose with 15mm nut fitting on both ends. These hoses are used to divert water around the shower cabin from the valve to the differnt atachments; hand shower, body jets etc. 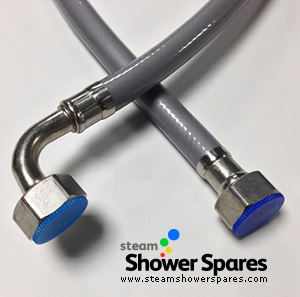 This hose is suitable for showers with threaded connections on the valve. Suitable for ALL showers including AquaLusso Alto and Opus Shower and Steam Shower models.This hose is suitable for showers with threaded connections on the valve. Please note these hoses differ slightly to the image shown and are actually supplied with 1 factory fitted connection and one customer removable connector to allow the length of the hoses to be adjusted easily on site.